We have made a pattern from a piece of fabric, which you can cut around [it includes plenty for a turnover all round the edge]. This is pinned up in the hall. 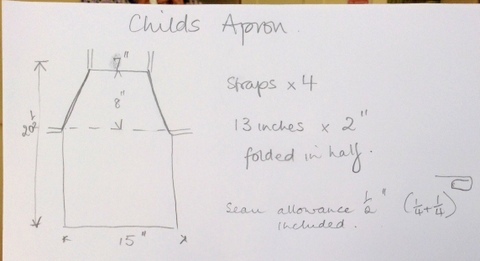 And I shall insert a photo of a note one of us made about measurements — spot the deliberate spelling mistake[s]. We have plenty of fabric. So far we have about 5 made, I think, so there is an opportunity for any one else to have a go, who wants to.